Address: 9229 S. Old Oregon Inlet Rd. For the 2019 season, a new raised walkway to the Beach is being constructed, the home will have new carpet and flooring throughout and a new Dimplex cool ice electric fireplace is being added in the living room. 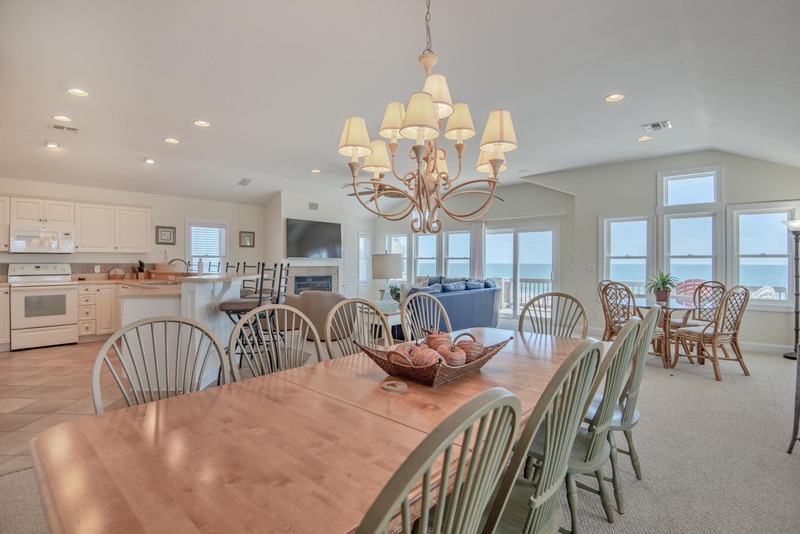 Stunning in both design & decor w/lovely furnishings throughout, the "JMJ Seascape" located in South Nags Head Oceanfront will pamper you w/ a wide array of amenities designed to ensure an outstanding vacation experience. 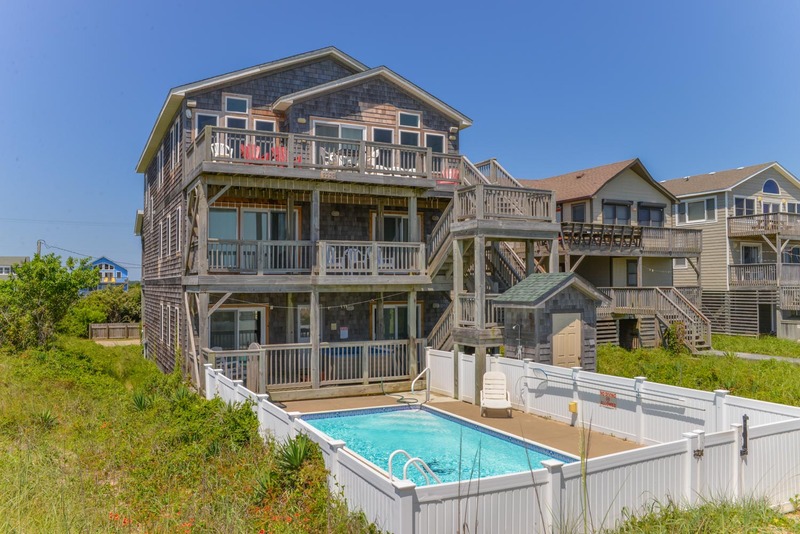 Modeled in the Old Nags Head Style, this spacious, bright, & airy house offers the luxury of a Private Ocean Front Swimming Pool, Large Hot Tub, an Elevator to each floor, & Private Beach Access. This home is very spacious with plenty of room for everyone to feel relaxed and comfortable. Each level will delight and your family will love spending time together in the top floor great room that features endless ocean views, well-furnished sun deck, large flat screen TV and breakfast bar. There are two rec.rooms, one on the mid-level w/Pool Table, TV, Wet Bar w/Full Size Refrigerator and direct access to a covered deck w/Hot Tub overlooking the pool area and another on the first level which is larger with Ping Pong, Foosball, Wet Bar w/Full Size Refrigerator, microwave, and sitting area w/TV. This is an extraordinary, dog friendly, vacation home that has so much to offer you will need to schedule time for the beach. Ground Level: Parking For 5 Cars, Covered Entry, Steps to Mid Level, Game Room w/Ping Pong, Foosball, Wet Bar w/Full Size Refrigerator, Microwave, Den Area w/TV, & DVD, Half Bath that Opens to the Pool Area, 2 Bedrooms (1 w/King & TV & 1 w/2 Bunks & TV), Shared Full Bath, Access to Patio Area, Private Swimming Pool, Gas Grill, & Private Walkway to Dune Top Deck w/Steps to Beach & Beautiful Ocean & Beach Views. Mid Level: Sports Bar w/ Pool Table, TV/DVD, Wet Bar w/Full Size Refrigerator, & Microwave, Laundry Area, 3 Bedrooms (1 Master w/King, TV, & Full Bath, 1 w/King & TV, & 1 w/Queen, TV, & Shared Full Bath), Full Hall Bath, & Covered Deck w/Furniture, Sound Views, & Ocean Views. 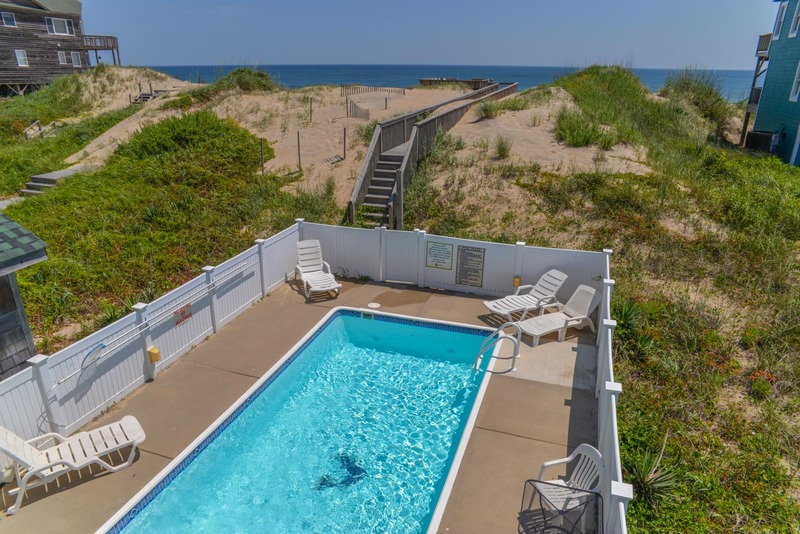 Top Floor: Beautiful & Spacious w/Living/Dining/Kitchen Area w/Under-Counter 50 lbs/day Ice Maker, TV, Half Bath, a Master Suite w/King, TV, & Full Bath w/Garden Tub and Shower, & Sun Deck w/Furniture & Fantastic Ocean Views. Features include: C/AC & Heat, Washer/Dryer, 2 Dishwashers, 3 Microwaves, Ice Maker, Phone, 9 TVs, 3 DVDs, Wireless Internet, & Ceiling Fans. Two Mature Dogs Allowed w/Fees. This is a Non-Smoking Unit. The house is absolutely awesome! LOVE the house and the location! The home is ideal ! Joe Lamb associates were great.House is ideal for big or multiple families. We loved the location. The house was fairly well maintained especially considering the number of people in and out. We experienced a problem with the doors. Our daughter-in-law is in a wheel chair. It was impossible to get her wheelchair through the very narrow (less than standard width) bathroom doors. Fortunately she had an extra wheelchair that could be left in the bathroom for use when she needed it. We were remiss in not realizing that, though the house had an elevator, it was not handicap accessible. The pool area was well maintained and very clean. Lovely place. Great view and lots of fun things. A great place for families as it has multiple recreation areas...ping pong, pool, foosball. Nicely decorated living room with awesome TV for movie viewing. The elevator is great for your bags and groceries!! Definitely would stay here again. Very comfortable bedding in each room! Nice, large stairways. Rooms were nicely-sized. This is one of the nicest houses we have stayed in that was clean and furniture not worn out. The lower level didn't feel dark and was also one of the nicest level for bedrooms we have ever seen. Would switch the game rooms to the front, however and establish another bedroom that could hear the ocean at night. Loved the layout of the kitchen, open to the family room. Great location and easy beach access.